Hosting Easter Brunch at your house this year? 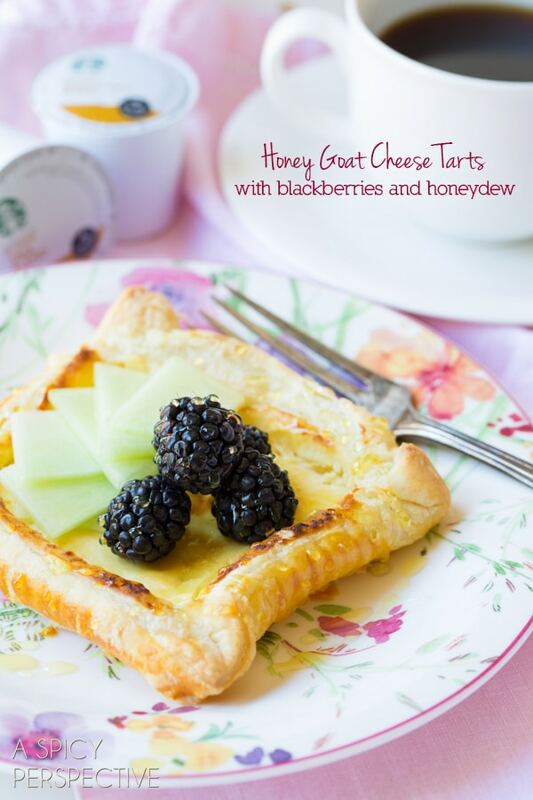 Why not serve each guest a honey and goat cheese tart with fresh blackberries and honeydew on top? You’re likely to start a new family tradition! Spring is here and it’s time to brunch. I don’t know why, but it seems brunch is reserved specifically for warm months. I wait all year to start inviting friends over for a late morning meal on the weekends. We always provide a couple breakfast options, a fresh salad of some sort, and then a few transitional dishes. 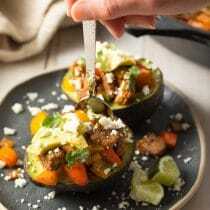 These transitional dishes could be anything… a lightly sweetened dessert, a dinner favorite I plan to serve in smaller portions, sandwiches, snack items, even soup. Really, the possibilities are endless. That’s what makes brunch so great! It’s a delicate sleepy-eyed free for all, where anything goes as long as you have fruit and eggs somewhere on the table. I like to serve a light pastry at brunches. Something that’s not quite a dessert (or at least not a very sweet dessert) but offers all the components of a treat… a rich ingredient, crunch-factor, a touch of sweetness, and something fresh. This Goat Cheese Tart served with sliced honeydew and blackberries captures all of this and then some. Buttery puff pastry is filled with a softened creamy goat cheese and honey mixture, then baked into crispy perfection. 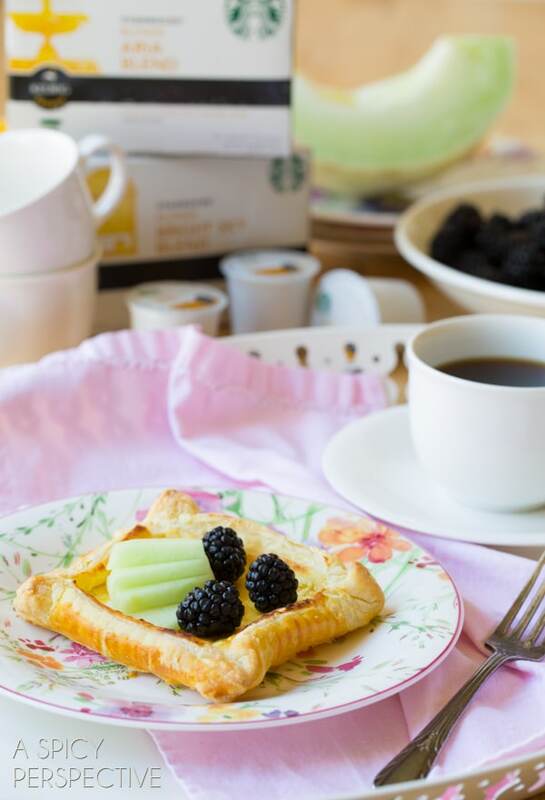 Once out of the oven, each goat cheese tart is kissed with fresh zingy blackberries and thin slices of honeydew melon, before receiving a final drizzle of sweet dripping honey. Something so light and ethereal deserves to be served at the most treasured meal of the week. And it deserves to be paired with a great cup of coffee. At weekend brunches we also make sure to have our guests covered in the beverage area. Often this includes a fresh squeezed juice or two, Lt. Dan’s famous Bloody Marys, and a great selection of coffees. Using Keurig® Special Edition Brewing System is the best way to serve coffee at brunch because everyone gets to choose the Starbucks Coffee they like. For spring, I prefer the new Starbucks Blonde Roast Coffees; light roasts with distinct flavors. Starbucks is sharing two new blonde roast coffees this year, Aria Blend and Bright Sky Blend. 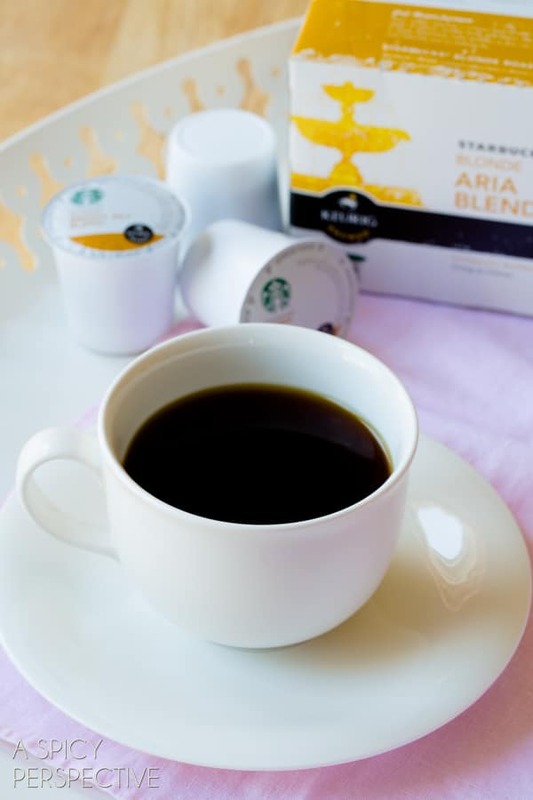 Starbucks® Aria Blend K-Cup® Packs offer a crisp citrus flavor and Starbucks® Bright Sky Blend K-Cup® Packs have a mild nutty quality. They are both delicious, so it’s hard to chose, but I like Starbucks Bright Sky Blend with the goat cheese tart. The nutty essence balances the tang from the goat cheese and blackberries, bringing out their fresh spring appeal. Preheat the oven to 400 degrees F and line two baking sheets with parchment paper. Place the softened goat cheese, 1 egg, honey and salt in a small bowl. Mash together with a fork until smooth. Lay the puff pastry sheets out on a floured work surface. Roll them slightly to remove the creases. Use a large knife or pizza cutter to cut each piece into 4 equal squares. Then use a fork to prick the center of each square, leaving a 1/2 inch border around the edges. Spoon the goat cheese mixture evenly on the 8 squares. Use a spatula to smooth out the goat cheese, covering the fork pricks. Then gently fold the borders over the edges of the goat cheese, pinching the corners to make smaller squares. Use the fork to gently crimp the flat edges on the sides of all the tarts. Then move them to the prepared baking sheets. Whisk the remaining egg with 2 Tb. of water. Brush the egg wash over the crimped crusts. 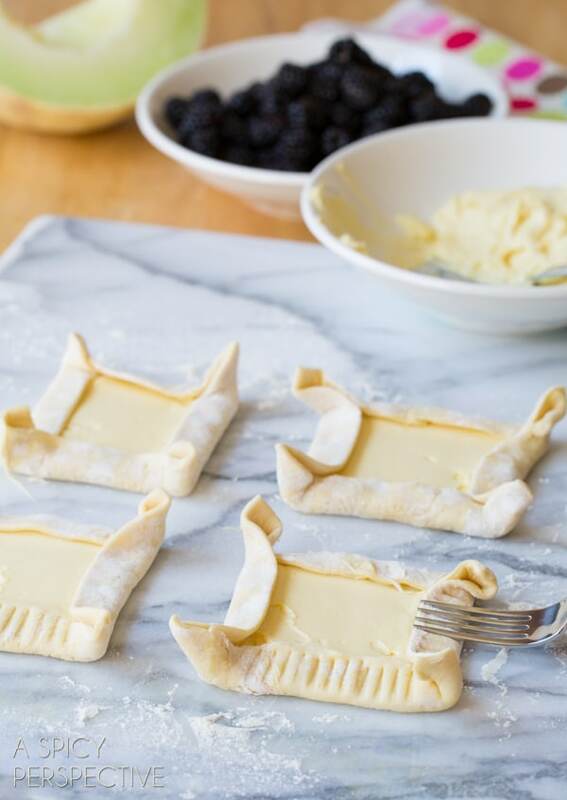 Bake the tarts for 15-20 minutes until the edges are golden brown. Remove the tarts from the oven and cool for at least 10 minutes. 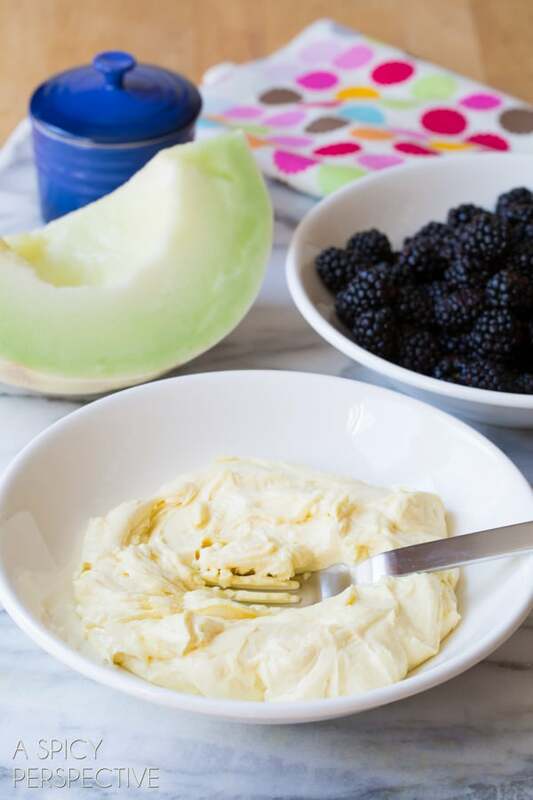 Then top with small slices of honeydew and fresh blackberries. Drizzle with honey and serve warm or at room temperature. Disclosure: This post is sponsored by Starbucks Coffee Company. All opinions are my own. 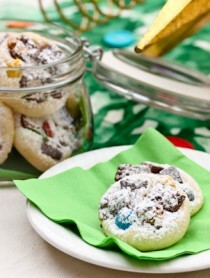 Pingback: Easter Desserts- You Need To Make! - Home. Made. Interest. Asparagus and mushroom frittata, sweet rolls or cinnamon coffee cake, BACON. Since coffee goes with just about everything, it’s hard to pick my favorite brunch items to serve with it. I do like to have pastries, like beignets, and frittatas, like zucchini, with coffee. My favorite is beignets dusted with powdered sugar. Something with eggs like an omelet. Some of my favorites for brunch are quiches and some type of scones or sweet muffins….yum! I enjoy fruit, quiche, and a pastry or two. Thank you for this opportunity! Swiss cheese omelet and rye toast. My favorite morning meal. My grandmas Carmel rolls…so sticky and delicious! My favorite is blueberry coffee cake. Any and every type of fruit pastries! I love to do omelets for brunch. 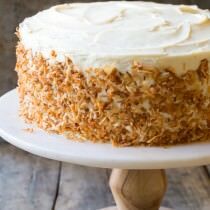 I love serving coffee cake. MMM. I love Creme brulee overnight french toast with fresh oranges. you have a great selection of coffees which gives me so many choices. I think I am going to try your recipe the next time~sounds so good. A good cup of coffee with cream cheese coffee cake! I love serving frittatas, egg-centric baked pancakes, and/or baked oatmeal for easy brunches for a crowd. Scones are my favorite thing to have and serve with coffee! Various pastries, such as coffee cake or Scandinavian pastry specialties like almond kringler, sunbuckles or Kransekake. 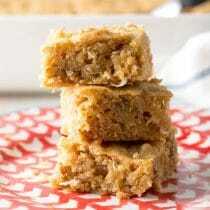 I serve apple coffee cake or blueberry muffins. I love serving waffles with coffee. Biscotti, Muffins, Crepes, Are Some Of My Favorite Items To Serve With Coffee. Bear claw from Bosa’s Donuts with coffee — my fav! I love to serve sweets and fruit for brunch with my coffee! I love my cheesy potato casserole! I love serving lemon poppy seed muffins!! My favorite is a breakfast pizza, fresh fruit and muffins. I like old fashioned glazed donuts with coffee. I love donuts & apple fritters with coffee!! What a delightful brunch addition! Perfect to go with the new Starbucks blonde roasts K-cups! YAY BRUNCH! It’s cliche (but true) that us gays love our brunch. :-) So… favorite thing to serve? Well, I usually go for a coffeecake, but I personally love smoked salmon. I’ll take it however I can get it, but ideally with an everything bagel and slices of cucumber on top. A warm cheese tart with fruit sounds comforting to ease into the day. A great cup of coffee to accompany it would make it perfect!!! My favorite brunch item to serve with coffee is a Sour Cream Coffeecake that my mother made when I was growing up. Yummy!! We love doing a buffet for brunch-bacon, sausage,eggs,cheese grits, fruit,a variety of breads and always something sweet with our homemade jams and great . . .
has to be. . .Starbucks coffees. Silver dollar pancakes are the perfect companion to coffee! eggs hollandaise – I can never make enough! I love danishes and fruit. French toast, eggs, bacon, cottage potatoes and maybe eggs benedict. Cinnamon rolls and baked French toast and baked oatmeal. I love to have quiche!! Banana bread or cinnamon bread. That goat cheese tart sounds delicious! I love coffee with a nice brie grilled sandwich :) or maybe a lovely little slice of lemon meringue pie or a lingonberry tart<3 yum! I love muffins and bagels with my coffee! This is right up my alley. I’ve always loved a cheese danish! Chilaquiles with beans and avocado!!! My favorite brunch item is sour cherry coffee cake. It would be perfect with a fresh cup of brew. Mine is an Indian dish called Dosa and Sambar. It’s like a rice crepe and spicy daal from the south of India. Favorite brunch item is a sweet savory bacon chocolate scone with a nice light roast cup of coffee. omlettes, blueberry crumb muffins, and fresh rolls or bread! I follow you on google plus. I love brunch & all of the ingredients in this recipe, so I can’t wait to make this! The Tartlet looks devine! I will have to try it soon. I love fruit or pastries. This looks so simple and delicious! I will definitely be trying it. Love Goat cheese, Starbucks & Keurig!!! Yum! Looks like something right up my alley! 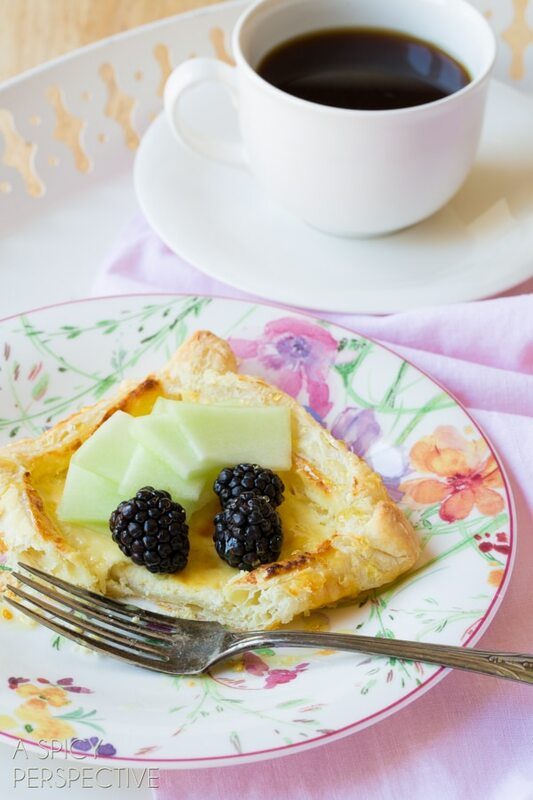 My favorite brunch items to serve with coffee are fresh fruit, coffee cake, pastries, egg dishes (such as breakfast casseroles,) French toast, etc. The possibilities are endless, as nearly everything goes with coffee! I like making the breakfast casserole with eggs, cheese, bacon, potatoes and milk. So yummy! My favorite brunch is Kouign Amann pastry or chocolate croissants! My favorite brunch items are crepes with mixed berries or banana to go with coffee. Love brunch….These look wonderful. Can’t wait to try. Love this recipe, perfect for spring. I love to make waffles, bacon and plenty of coffee! Would love to win this gift. I love some sweet pancakes with coffee! You can never go wrong with cheese, pastry, and coffee! i love eggs and waffles! I love to serve sweet and savory crepes. I love to make baked oatmeals and waffles. I love any donut or bagel with a delicious cup of coffee! Fresh fruit and bite size pastries!! This looks so delicious! 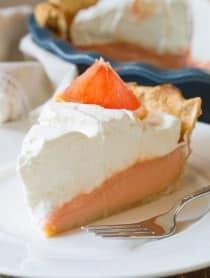 I’ve never made a tart before, but definitely want to give this a try! Frittata with goat cheese and tomatoes with some of this fabulous coffee. Muffins (dipped in coffee) with eggs and bacon. I have never eaten goat cheese but the honey goat cheese tart looks delicious. I can’t wait to try this recipe. My favorite brunch items to serve with coffee are an assortment of donuts, muffins, croissants and fruit! I would love to win this. Thanks for the giveaway. I would make some cinnamon chocolate scones. I like cinnamon rolls with coffee. This is spring in a tart and gorgeous too!! I adore puff pastry tarts!! And goat cheese sounds so tangy and bright to go with that morning cuppa joe! I like to have a variety of sweet and savory, so some pastries/muffins/sweet rolls as well as sausage, eggs and usually some kind of baked strata/casserole dish along with a variety of fruit. love to make little hash-brown & egg “baskets” in muffin cups–with fresh pico on the side! This tart sounds just delicious! I love serving fresh fruit and good crusty bread with specialty butter form brunch. I love serving cinnamon rolls with cream cheese frosting! I’m all about the savory brunch treats: breakfast casseroles, hash browns, crispy bacon, crab cakes (I live in the south! ), sausage gravy… and bloody marys, of course! eggs benedict, with tomato and spinach! For brunch I love to make a Double-Streusel Coffee Cake and a good cup of coffee to go with it. The honey and goat cheese tart looks so delicious and I’ll have to make it sometime. So gorgeous and perfect for spring! This is such a creative fun sweet for spring!!! Such stunning colors too! love it! Chocolate chip scones – dip them in my coffee and they are amazing! 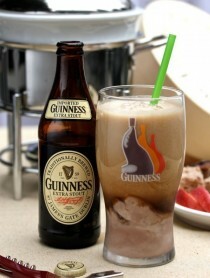 This would be fantastic with the Bright Sky Blend and some Frangelico! You made it look soooo easy. We have a couple of wonderful prize winning goat cheese dairies in my area. What a perfect spring recipe. It flat out looks cheerful. I am a huge fan of quiches, any kind! I love having quiches and coffee when I host brunch for family and friends! I love to make crepes for brunch. A little fresh fresh fruit and coffee to go along with them, and it is the start of a wonderful day! I love to make bruschetta to go with brunch. I love goat cheese…sweet or savory! My favorite brunch item is always French Toast! I like to serve muffins and eggs. I think cheese danish or scones would be ideal to serve. I have a bacon and egg pizza with brie that is a delicious brunch item. 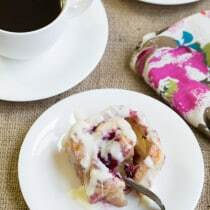 something sweet – muffins or cinnamon rolls! Biscuits go good with it! My favorite brunch to serve with coffee is a cinnamon pull apart bread. So yummy. And I can’t wait to try your goat cheese tart. So beautiful! Waffles with fresh fruit, hashbrowns, and of course bacon! My favorite things to serve with coffee and brunch are assorted danishes! Cheese danishes are my favorite! Homemade Shortbread cookies along with fresh Strawberries & Cream. These look decadent but easy…perfect for brunch! Love these tarts! I love a sweet pastry to go with my coffee! I like to serve egg white omelettes, coffee cake and raspberries for brunch with coffee. Coffee cake or danish pastry. Although I’ll be giving these a try soon — maybe for Mother’s Day. Cheese danishes are my hands-down favorite thing to have with coffee! I usually make a breakfast casserole. I like to make a quiche or breakfast casserole. These goat cheese tarts look delicious! Yum! looks great, will have to make this! thx! The goat cheese tarts looks device! !I will be making them today!! !I can’t wait to taste them!! !Thanks for these great recipes!!! I go for the pastries and eat them with bacon. Homemade waffles and stick buns go great with coffee! Bruch means either Eggs Benedict or Belgian Waffles! I love Both but make only the Eggs at home. The Waffles are for when we go out! I always love freshly baked cinnamon rolls smothered in cream cheese frosting! Coffee in my house goes well with just about anything…but coffee cake and fruit are always delicious! roasted potatoes, italian sausage patties, scrambled eggs, and fresh fruit. This gorgeous tart makes me hopeful that spring is on it’s way finally! That tart is a thing of beauty…my family would be so excited if I served that as part of Sunday brunch. My favorite brunch item with coffee…my pumpkin spice latte muffins. I love the flavor profile on this – goat cheese with fruit and honey – yes, m’am! I love to serve French Toast, either sweet or savory! I love coffee cake or scones with my coffee for brunch. This is SO pretty Sommer! this is exactly what I would want with my morning coffee! I adore brunching! Sign me up for any kind of tart. MMM my fav is homemade blueberry buttermilk pancakes, maple syrup, bacon and the coffee! Fresh, hot, gooey, cinnamon rolls. Yum- I like to have a croissant with coffee if I can. But usually resort to a donut. Goat cheese and a tart?! Yes, please! 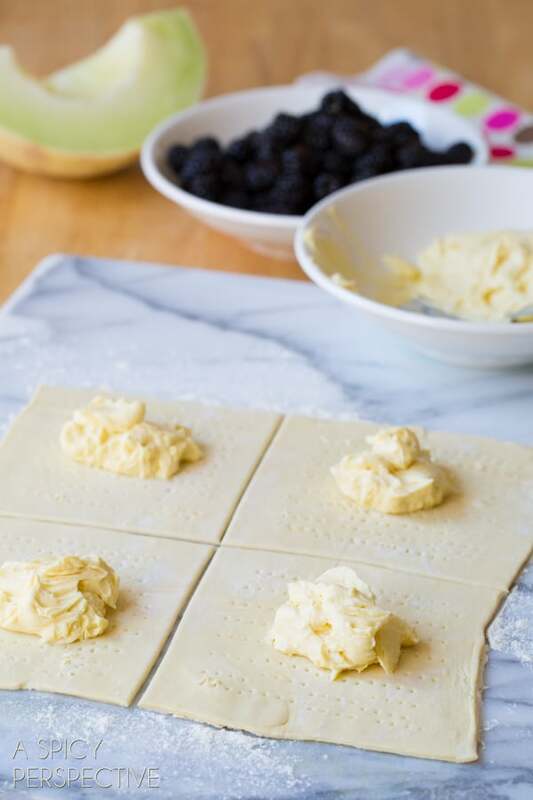 might have to try this puff pastry thing…. I LOVE goat cheese and new ways to cook with it! I always go with huevos rancheros for brunch! Love to serve coffe cake with coffee or cheese danishes! Blackberries are my favorite! Love! This looks very easy and very yummy. We are going to def give this a try soon. I love french toast casserole. Or egg casserole with lots of veggies! I love scones ! And fruit lots of fruit! Even a casserole with sausage and cheese and eggs! All things yummy! These tarts sound so nice and simple and so good! I like to serve bagels with cream cheese and smoked salmon. This looks great! I think homemade cinnamon sugar doughnuts would be great with this coffee. I like pancakes, fruit, and breakfast potatoes! Thanks for the giveaway! I like to make a cheesy potato casserole! Oh, those little tarts look and sound delicious!! 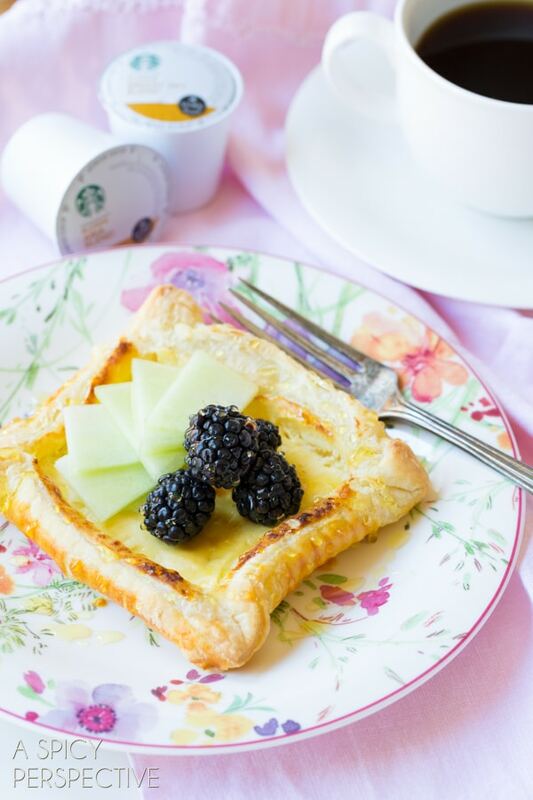 Loving this fun springtime tart!! Goat cheese is my fav!! Love us some brunch on the SC coast where every weekend is a vacation! Faves are an egg and sausage/bacon dish (casserole or quiche) with sweet pastry or muffins, fresh fruit salad, yogurt, juice (with or without champagne or bloody mary mix), and lots of Keurig coffee pods for folks to choose their favorite brew. I love the tarts. They are perfect. I like scones with coffee. Brunch is one of our favorites – eggs benedict is a meal that we love. French toast casserole is another. Fruit salad. bacon and some sort of scone or cheese danish. Homemade of course. I love quiche as a brunch item. A little something to help you wake up in the morning? Yum! Goat cheese tarts!! Can’t wait to make them! I like to serve waffles, savory and sweet. We’re pretty traditional around here when it comes to brunch! Bacon, eggs and lightly buttered toast are always on the menu, alongside a steaming cup of coffee! Thanks for the chance to win. We don’t do a lot of brunch but those look so yummy! :-) I love any kind of tart, pastry, biscuit, etc with my coffee. Something a little sweet! This tart looks so light and tasty for Spring. Can’t wait to try it. Love puff pastry. What a pretty Spring tart! So cheery!